I've seen a couple of different people use these questions for their weekly updates and it seems like a good idea so I'm going to give it a try. Also please take your best guess as to if we are having a girl or a boy on the poll to the right! We find out sometime during the first 2 weeks of May so you have till then! 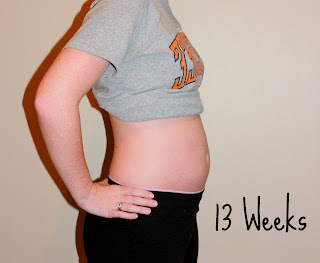 How far along: I am actually 15 weeks now, but this will be a review of 13 & 14. Total weight gain: As of my last appointment on April 1st, I have gained 1 pound. I asked him about how much I should gain in the 2nd trimester and he said about 10 pounds to stay on track so we will see how that goes. Maternity clothes: Not for these weeks, but it's coming....at least for somethings. I have had to go shopping a little bit to get some longer and more flowy tops and those seem to work well for me now. My jeans are thankfully low enough to where it doesn't bother me and since I'm not working I mostly stay in yoga pants all day since they are stretchy and comfy. I should probably invest in another pair of those lol. Sleep: No problems here really. I do have to get up and pee once a night and have been since I became pregnant. What's annoying is that I don't even have to pee that much. It's just uncomfortable. Other than that I'm getting plenty of beauty rest. Cravings: Ummm....sugar? Don't kill me!!! I know that is bad, but I gave it up for Lent and it now seems that my body wants back the 40 day supply that I denied it. I'm sure this will bring on the pounds if I don't get this craving over with. Can someone come and destroy all the Easter candy we have left please? Thanks. Best moment for these weeks: Hearing the heartbeat again and knowing that it won't be too much longer before we find out what we are having. Movement: Nada - that should be coming soon although I doubt I will even be able to recognize it. Belly button in or out: I've always referred to my belly button as an inny-outty. It's in but you can still see it when I'm not pregnant. It's not one of those deep inny's. This is really weird describing my belly button in detail!!! Ok so for now...it's more flat. There. What I miss: 75% of my closet. I have since packed all the crap I can't wear and it is so sad now. My husband might actually have more clothes than me now and I'm still finding things I can't wear! Agh! It's just going to get worse. Weekly wisdom: Funny story (wisdom at the end): The doctor's office was really busy my last appointment and when they called me back they ended up putting me in the procedure room. It had a nicer version of the stirrup chair if there is one of those and one of those metal equipment trays beside it. Also it had several pieces of very scary equipment. - Your husband will make up stories about what each piece of scary equipment does. - Although the stories are absurd, your heart rate will go up. - You will find yourself not being able to remember if you asked last time what you'll be doing on this appointment. - They will move you to another room if you look freaked out enough. 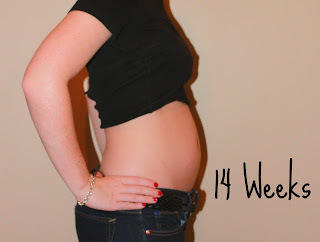 Milestones: Making it into the second trimester!!! Favorite moments: Finally naming our baby: Pistachio!!! Ok, so we haven't come up with a real name yet but it's better than "It" or "That thing growing inside me". Pistachio seems much more enduring. Michael's dad refers to it as "Bubba" and "Bubbarina" and one of our friends calls it "Ike". It's well named for now. You look great!! Definitely have a mini bump! awww you're looking so cute! love the little bump! Awww Laura!!! I'm so ecstatic that the little peanut is growing healthy - I love it!!! Can't wait to see more pics of your cute belly! i love your posts with belly pictures! i find it so fascinating. :) your little boo is definitely starting to show. you look very cute! A Week Full of Wonderful Surprises!